I figured that it would be hell to explain this without pictures. so i quickly put this together..and it went pretty fast so you'll have to bare with the rather dull layout and the "alternative" spelling that might be here and there!. Anyway i made this little example for you, and i suggest you try and do that first before you start working on your own picture. Just follow it step by step and, if i didn't make any errors you should be alright:). 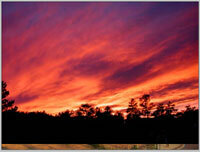 On the right there's links to 2 pictures "skyline" and "sunset" Right click on them and select save target as. 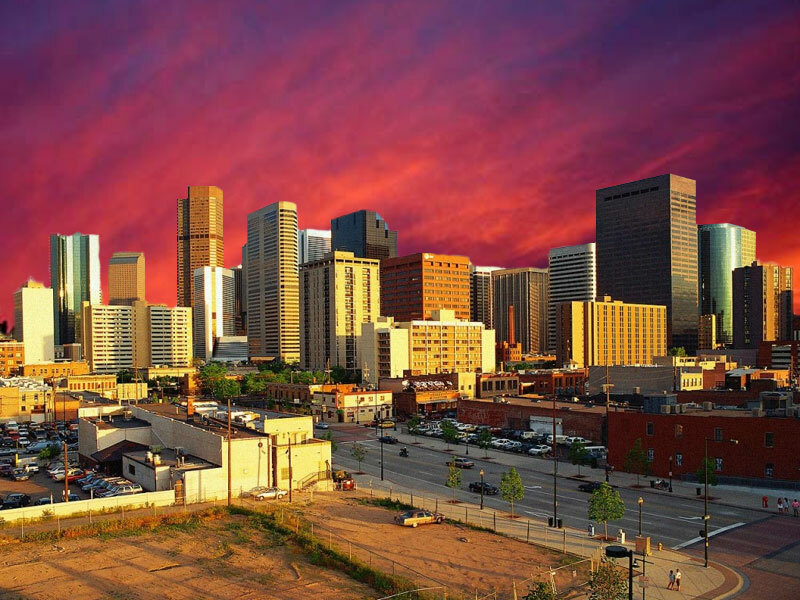 What we want to do, is replace the blue sky on "Skyline" with the "Sunset" background. 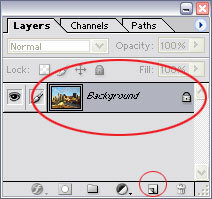 Open "skyline" in photoshop, if you look at the list of layers, you will notice a small lock icon on the layer called background to remove that just make a copy of the layer drag the layer to the "new layer button". 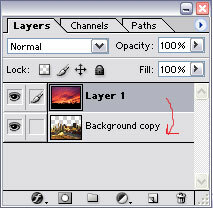 Now you should have 2 layers "background" and "background copy" select the "background" layer just by clicking on it, and drag it to the little trashcan icon, right next to the new layer button you used before. So now you have 1 layer. *the reason why were doing this, is that it's bmp pictures and you can't edit the background layer on those, if your working with jpg you probably don't have to do it, but i thought i'd just show you anyway. So, now you can begin cutting out the sky. the magic wand tool can be useful sometimes, but for this it wouldn't be accurate enough and it would leave us with jagged edges and a generally poor result. Instead you should use the Quick Mask tool it's right below the forground/background color thing in your tools palette, just click it once. Select the Rectangular Marquee Tool by clicking it's icon (top left corner of the tools pallete, alternatively you can just press M). 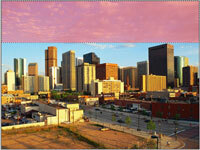 Make a selection, that goes from the top left corner of the picture, and stops just over the tallest of the buildings. 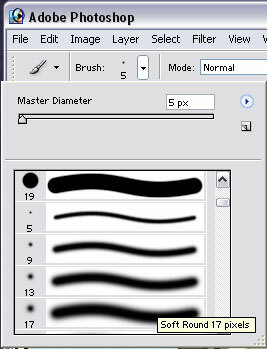 go to Edit > Fill a small window will open, make sure Foreground color is selected in the USE dropdown box. when your done just click OK. Remove the selection CTRL+D Now zoom in on some part of the sky next to the buildings, just start on the left and work you way to the right. You might want to zoom in for this use the Magnifying Glass to zoom in, if you want to zoom out, just hold ALT the little + in the magnifying glass should change to a - indicating that your now zooming out. Anyway, once your zoomed in a bit on the image (around 300% should do it, but just use whatever you like). take a soft brush, not too big and paint around but not over the buildings covering all of the sky (the brushtool shortcut is B). I started out with Soft brush size 13, but you will probably change it quite a bit, you'll soon find out whats best, for the small details you'll obvioulsly use a smaller one. You'll need a bit of patience and a steady hand, a good idea is to let go of the left mousebutton once in a while, and then start again. The reason is, that if you make a big error (i.e. painting over a big part of the builiding you can undo it by pressing CTRL+Z. now if you painted for a while without letting go of the left mousebutton and you press ctrl+z you will loose a lot of your work, by moving in small steps your avoiding that. If you make a error you can also use the Eraser Tool (shotcut E). to delete part of the red, if you make an error. On the image to the right you can see, how iv'e painted some of the image, it doesn't have to be 100% accurate, and it's alright if it overlaps with 1 or 2 pixels here and there. But ofcourse the more accurate you can do it the better the final result. For bigger areas you can still use the Regtangular Marquee Tool and Edit > Fill like you did earlier. Remember CTRL+D to deselect a selection. Since this is builidings, with a lot of straight lines, you can use the "select and fill method" quite a lot, if it were something with more fine details, like e.g. a tree you would have to use the brush more, but i assume you figured that by now..anyway this sounds more difficult than it is. Remeber you can use all the Marquee tools if you like, sometimes it can be useful to use the Polygonal Lasso tool, just play around with it. Sooner or later you will end up with something that looks like the picture on the right. click the Edit in Standard Mode button it's to the left of the Quick Mask button you clicked earlier. You will now have a selection, and you will notice that the selection is covering the city, and not the sky. To fix that click Select > Inverse. Now you should have a nice selection of the sky. Press the Delete key on your keyboard. Voila! one city without sky!. So, this is where it get's interesting!. Open the "sunset" picture you downloaded earlier (without closing the "skyline" picture). click Select > All click CTRL+C to copy the selection. 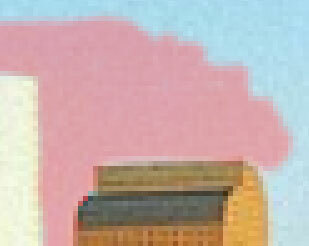 Switch back to the "Skyline" picture, and click CTRL+V to paste what you just copied. 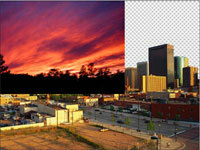 "Sunset" should now appear in the middle of the "Skyline" pic use the Move tool (shortcut V). and drag it to the top left corner, like i did on the picture to the right. Make sure the Sunset layer is selected, it will probably be called Layer 1 Click Edit > Transform > Scale the sunset Layer will be highlighted and some squares will appear along it's edges. Hold down the Shift key and drag the little square in the bottom right of the sunset layer. Drag until it fills up, and covers most of the layer with the buildings. Should look something like what you see on the right. Now, just for the finishing touch. press CTRL and left click the layer with the city. the city should now be selected. Click Select > Modify > Contract and type 1 when it asks how many pixels you want to contract with. click ok. click Select > Inverse and then press the Delete key on your keyboard. This will remove any edges on the city layer, and just make it look nicer. And thats basically it. iv'e uploaded what i ended up with just right click and save the link to the right.So when you want to do this on your own pictues the forumla is something like this: 1) Find a picture with whatever kind of sky/background you like. 2) delete background/sky of your own picture. 3) Put the new sky/background on a layer below your original picture. Need anything else, and you know where to find me. Good luck!. What I ended up with!